This guide will show you how to use Wondershare AllMyTube to download your favorite YouTube videos for enjoy anywhere you want. Wondershare AllMyTube for Mac is one of the easy yet powerful YouTube downloader applications on the market. Usually you don't need a guide to use it - just install, explore and start downloading. However, you can refer this guide if you're new to YouTube download and when you encounter a problem. First download and install Wondershare AllMyTube for Mac to your system. You need to authorize applications from anywhere. 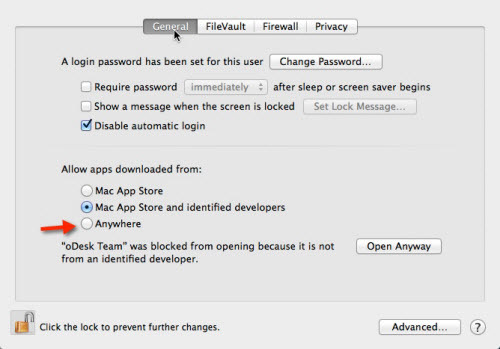 We recommend you change the option temporally for security reason. After installing AllMyTube, it's better to change it back. To do so, go to Apple Menu, then select System Preferences > Security & Privacy, and then locate and change Allow downloaded apps from to Anywhere. In our opinion, this might be the most difficult part of using AllMyTube. Once installing it successfully, you can go playing YouTube video as normal. The only difference is the Download button which will display in the YouTube video page when you hang over your mouse over the video. If it doesn't appear, go to Web Browser Downloader Addon page for details. Wondershare YouTube Downloader for Mac supports downloading YouTube video in all format, including HD, HQ, 4K, HTML5, etc. When the download menu appears, select your resolutions and click to activate AllMyTube for Mac. The video will start downloading very quickly. You can go on exploring and enjoying YouTube video while leaving AllMyTube working in the background. Up to 8 videos can be downloaded at the same time depending on your settings in the Preferences panel. 1. Find the video in the Downloaded tab and click the Convert button. 2. Choose an output format from the resulting window. Go through different categories for desired output presets. 3. Click OK to start conversion. When complete, right click the video and select Locate Converted Files to show in Finder. If you've selected iPhone/iPod/iPad devices and the option "Export to iTunes", you can also find it in your iTunes Library. You can easily sync YouTube video to your device with iTunes if preview is OK. Besides iTunes, you can also transfer YouTube videos to your Android and Apple devices using AllMyTube's unique wireless transfer feature. Wondershare Player is required and the same WiFi network has to be used. Below is the general outline to transfer YouTube video wirelessly. 1. 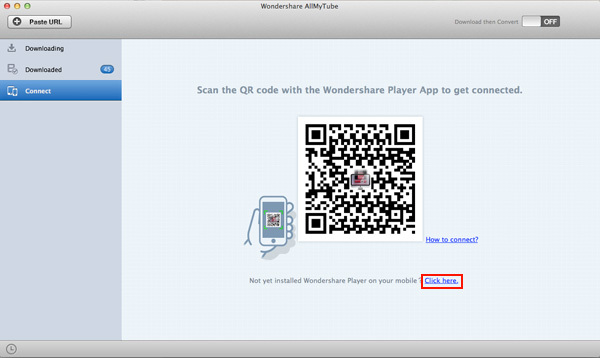 Download and install Wondershare Player by scanning the provided QR code in the Connect tab. A QR scanner app is required. 2. Pair your device with AllMyTube using Wondershare Player. To do so, start Wondershare Player app on your device and go to Transfer via WiFi -> Scan QR code to scan the QR code in the Connect window as below. 3. Go to the Downloaded tab and click the Transfer icon transfer the selected YouTube video to your mobile device (Android and iOS). According to our analysis, most people download YouTube and convert it to MP3 format to enjoy on their iPhone, iPod, iPad and MP3 Player. That's why we put more attention on YouTube to MP3 downloading and conversion. AllMyTube makes it easier than ever to get things done. Here we introduce various ways to download YouTube to MP3 on Mac with AllMyTube (Yes, you'll find more ways). 1. MP3 option in the Download menu: as you may know, there is a direct option in the download menu of YouTube video. Simply click it and AllMyTube will open to start downloading MP3 from YouTube's server. The audio quality is 100% original. 2. YouTube to MP3 button: This is the most classic way to download either YouTube video or audio. AllMyTube will track the clipboard. After copying the URL, clicking the YouTube to MP3 button in the primary window will start downloading MP3. This way might still work even if the download menu doesn't appear. 3. YouTube playlist to MP3: Usually, YouTube videos will be downloaded when you click the Playlist option in the download menu. You need to convert YouTube video to MP3 after downloaded. But if you're in the Download then Convert mode, you can directly download youTube playlist to MP3 without manual conversion. What you need to do is just click Download then Convert in the primary window and choose MP3 from the Audio category when the format window opens. Now choose Playlist in the download menu and you'll get YouTube MP3 files as well as YouTube videos files.